OK, the season premier we have all been waiting for is HERE! Tune into the Hallmark Channel this Saturday for the 2 hour special! Open to valid addresses in US and Canada only. 1. 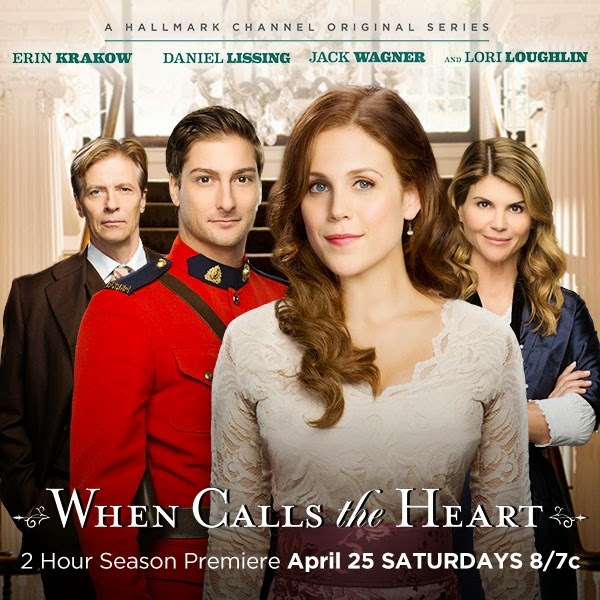 Answer this question- Who is your favorite character(s) on When Calls the Heart and why? 2. Be sure to include your email address so I can contact you if you are the winner. Giveaway ends: SUNDAY, May 3 at midnight. Answer to Number 1: Abigail has to be my favorite character! She is kind and helpful- and she does wonderful baking on the show! :) Can't wait to see how the trial goes in Season 2! I haven't read this series yet, but I've read other books by her that I enjoyed. This looks great! Thanks for providing the giveaway. I like really like Abigail. I love Abigail! I cant get these on TV where I live- so I would love to win! I haven't seen the Hallmark programs but... many years ago I read the Canadian West series and loved equally the characters Elizabeth and Wynn Delaney, and loved the pure and wholesome stories as they unfolded. I haven't seen the show yet! I'll have to see if I can catch up on it.